We love all of our cookware, but since the time we got it about two years ago, one pan has stood out from the rest in terms of utility and frequency of use: our large nonstick deep saute pan. 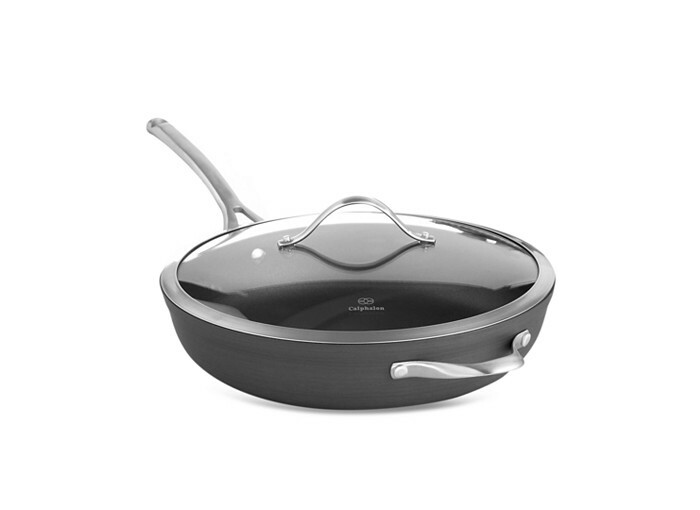 For almost any dish that requires a saute we use this pan. The size accommodates our medium to large meals (we love having leftovers), the high sides keep us from making a mess and let us toss a pasta dish together, and it's bakeable, which comes in handy every now and then (e.g. fake bake or baked mac and cheese). Unfortunately, due to constant use and maybe some occasional overheating, the nonstick coating was starting to fail in the center of the pan. With the difficulty of washing it and concern about consuming the nonstick coating, we decided to seek out a replacement. We found that replacement in a Le Creuset deep saute pan! We had been eyeing this pan online, and then Whitney was lucky to get a great deal on a floor model that had been on clearance in our local Williams-Sonoma. We were super excited! 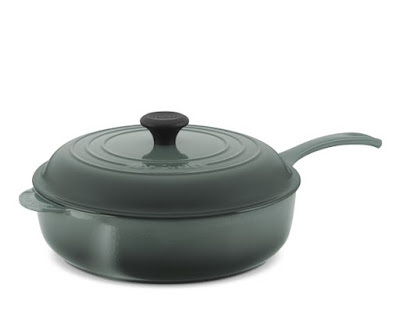 We've enjoyed our other Le Creuset cast iron enamel pieces. The enamel comes clean easily and hasn't showed any signs of accumulated wear. The one downside is that it's super heavy, but it's worth it to have a pan we love that will hopefully last forever. We've also decided that it makes sense to store it on the top since it is so heavy and we use it so much! It was a joy to use each time. Today we'll feature the lemon risotto recipe, which was a new risotto style for us. I probably wouldn't rank it above my favorite lemon spaghetti or some of our other risotto preparations, but it was still quite good. Heat the olive oil in a large, heavy saucepan over medium heat, then add the onions, shallots, garlic, and salt and saute, stirring constantly, for about 4 minutes, or until the onion begins to soften. Add the barley to the pot and stir until coated with a nice sheen, then add the white wine and simmer for 3 or 4 minutes, until the barley has absorbed the liquid a bit. Adjust the heat to maintain a gentle, active simmer. In increments, add about 6 cups of water or stock, 1 cup at a time, letting the barley absorb most of the liquid between additions; this should take around 40 minutes altogether. Stir regularly so the grains on the bottom of the pan don't scorch. You will know when the barley is cooked because it won't offer up much resistance when chewing (it will, however, be chewier than Arborio rice). When the barley is tender remove the pot from heat. Stir in the lemon zest, Parmesan, and crème fraiche. Taste and adjust - add more salt if needed, more lemon zest. Then stir in the greens. Garnish with toasted pine nuts and a dusting of extra Parmesan before serving. I don't think I have ever worn out a pan! Don't cook as much as you do though.